Ooh a new character introduction from A Noble Curse! 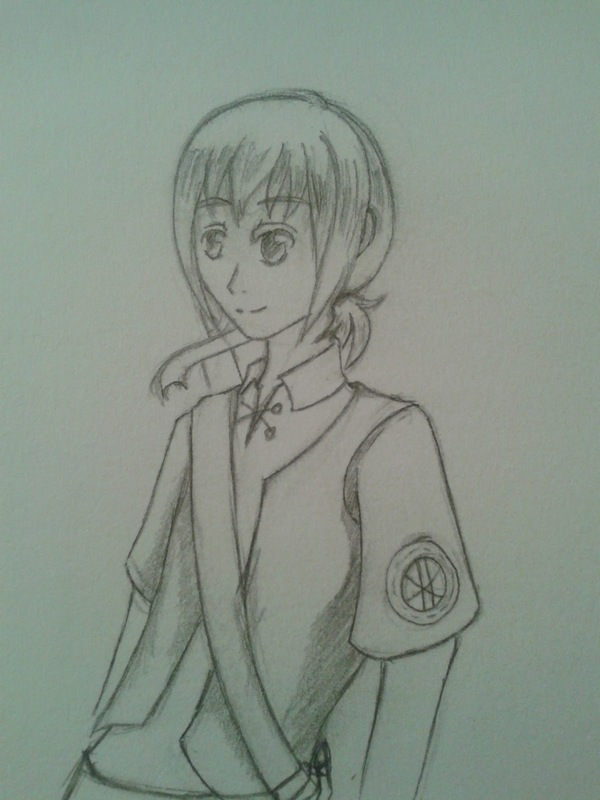 This here is Roland Stark, the head officer of the royal guards and one of the five heroes of Crylite. 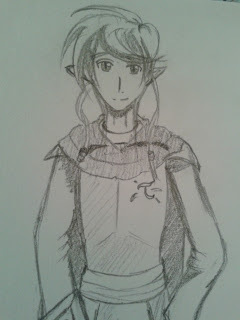 Our lively trio will encounter him a lot in the manga (though he's not the first of the heroes they meet). I've been working on A Noble Curse for the past few days. 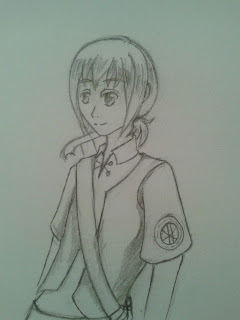 Probably because I bought some manga myself which inspires me again to draw. This is the last post for the year! From myself here at Azure Tales: I wish you a happy new year and will post up in January! I may redesign the signature sword as well at some point but for now this little teaser will have to do! More pictures coming up as the weeks go by, check out our twitter account! I might post some pictures there. The script and general code for Spero: The Ocean Divers is done (so it's a visual novel... without the visuals). Hopefully a screenshot of the game in progress next January. I cannot thank you enough for your patience! First of all: I missed a blog post on the 5th October, sorry about that! There's not much news to report except Miyu will be the only character to change a fair bit in the remake of Spero: The Forest Dwellers. This is because she looks exactly the same as two other characters I've designed in previous projects ^_^; The only thing that will change is her hairstyle really. Secondly there won't be ANY blog updates next month. My studies take priority (since without them I'd never have gotten this far!). There's a lot of coursework and tests in the next month. I'll make more progress during the Christmas holidays. Again thank you all for your patience! No picture today sorry! Forward with the news! I'm changing the process that applies to creating this. I'll be writing out the story first and yes... it takes more time. The reason being is that this method allows me to see the story flow better, rather than a flow chart of what I want to happen. With the changes that I made to the original... I'll need to write out how I want the story to flow. This is still going as planned. I've not started the code work other than the template for the game (in Ren'Py). Using random images instead of what should be there is difficult and confusing so this will have to wait until I'm in the UK. Speaking of which: By the next update post I'll be back in the UK! My holiday is ending soon (Well, my time overseas anyway). As for the poll... again that will have to wait until I'm back in the UK. I'm assuming it's something to do with the browser or my netbook messing up. Azure Tales' 1st anniversary has come! Wow it really has been a year since I shouted "It'll be Azure Tales!" at the laptop (to my brother over a video call). It may not seem like we've done much (Having only released a short visual novel) but Azure Tales was built from scratch and has made a lot of progress from being just an ambition in my head. I may still be a one-man team, but I have had plenty of support from my family and friends (and still do!). So a big thanks and cheers to them! If it weren't for you guys, I'd never have had the courage to even think of starting up Azure Tales. With that I look forward to the future progress of Azure Tales and all my projects. A final thanks to all of YOU as well! Your encouragement and kind words mean a lot and I hope you will continue to enjoy the projects I release. A few things to mention and announce today! First of all A Noble Curse is on hold. I say that, but what I mean is I'm rewriting it again. But not changing the entire thing... it's going to take a while to work out in short. I have little experience in editing anything vocal wise. So I will have to rely on the original quality of the work you send me. If there's too much background noise or static, I can't use it. You will have to sign some kind of Non-Disclosure agreement, as I may need your services again for future works of the same series. With that in mind. The work is VOLUNTARY if you don't think you can manage much along with your actual schedule then I advise you not to apply. I give deadlines. They're usually flexible though, depending on your circumstances. If you repeatedly break them, I will find someone else. Also we'll be running polls on the blog! Some for fun and some are genuinely for feedback. This time it's for fun. Who is your favourite character in Spero: The Forest Dwellers? I'll draw a picture of the winner (and runners up) for the update after next ;3 You can find the poll at the top right of the blog. [Edit] The poll isn't letting me add more than 4 answers for some reason so please wait until another day! Not much to say this time. A Noble Curse is moving along at a... strange rate XD It's nearly halfway done being storyboarded. There's a picture of Clare's original design above this. 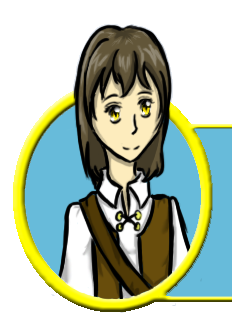 Clare is the travelling artist our two main characters meet in chapter 1. She's a kind hearted type, but she doesn't hesitate to shout or complain when things aren't going how she wants (She'll even kick poor Albert a lot). Spero: The Ocean Divers is progressing well with the script. Even started doing some code work in Ren'Py. Voice acting still not holding auditions yet. Haven't had time to write up agreements and all that legal stuff T_T but I promise it's coming soon! Thought I'd show a bit more info on Ocean Divers. Above is the main character and his best friend, Conrad and Miles respectively. Conrad is an impulsive 17 year old, so you'll be in a few situations where he may act rash without your consent XD. Miles on the other hand is the more 'playful' of the two. He may not SEEM to play a huge part in the game but your behaviour towards him might just turn a situation around. One more piece of news today: we now have a public e-mail address for you to... well, e-mail us if there's any problems, feedback etc. We make a point to not keep e-mails longer than needed (usually 30 days at most) so rest assured you can e-mail us and we don't store your e-mail address for very long. It will take a week at most (certain circumstances apply if we aren't available) to respond. We also accept fanart! It's in fact encouraging to see it, who knows... maybe we'll hold a contest! Please be responsible when sending us e-mails (In other words: no malicious behaviour or attitude and certainly no spam... these e-mails will be ignored). I was going to throw a questionnaire but decided not to. But please do let us know if there's anything about Spero: The Forest Dwellers that you want to say (Screen resolution change, opinions on voice acting etc.). You can comment on any post on the blog (I usually recommend the latest post) as we can see all comments regardless of which post! So after a bit of debate I decided to do an update post every 5th and 20th of each month. The only exception being when I'm really busy that day so it'll either be postponed or posted a bit earlier. For those asking about Spero: The Forest Dweller updates, I can't work on that unless I'm in the UK. I've got limited time and resources while I'm overseas, so don't expect any updates on it for at least a few months yet! Also if there are any Linux users who can't play the game let me know and I'll upload a version for it (The only reason I haven't done so is because it's untested). 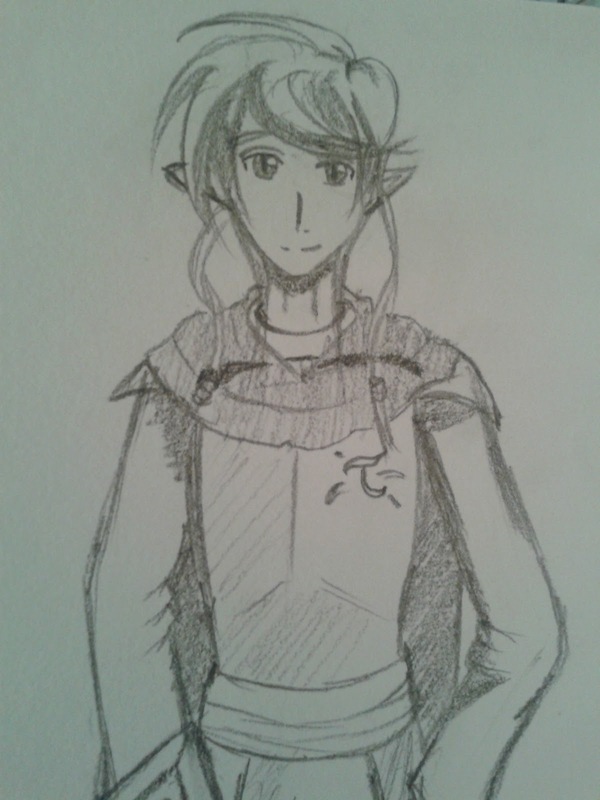 Speaking of Spero: The Forest Dwellers, who would like voice acting included? I'd make an option for you to switch it off of course but I've had a few volunteers for voice acting. Let me know your thoughts on it! It's been 1 week since Spero: The Forest Dwellers launched and I've had some great feedback and support! Thank you all who have enjoyed it so far. I'm sure those who have had a play will have guessed what I'm announcing today, and those who follow us on Twitter (@AzureTales) will have heard a little about Project 3 already. The chapter had already been planned from the start, and I've started the script (Reverse order on what I worked on for SperoFD which started with the art first). I've no release date yet since I'm currently overseas and can't do any final artwork. The visual novel is planned to be longer than SperoFD though (there's a lot of text for this one!). More details on the game will follow once the script hits about 50% done. The manga is set in the kingdom of Crylite, where a cursed beast roams the land and causes tame monsters to go on a rampage across the towns. A pair of merchant siblings, travel to help those who have been hurt and to find a way to rid the cursed beast. That's it for this announcement! 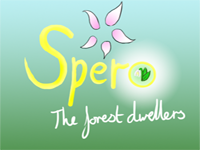 The next blog post will be a quick questionnaire about Spero: The Forest Dwellers. (I'm setting up an e-mail account as well) look forward to some work in progress art and more updates over the next few months. Also: I won't be available for contact between 9th June 2012 - 14th June 2012 as I'm on a trip with my family. So sorry it's been so long! I've been caught up in studies but I can finally say that I'm now done for summer holidays! Yes, I said Spero was due in spring, I'm sorry to announce there's a delay until MAY and hopefully no further than that. Programming - 30% - can't do much without the script in there! I am changing to using Ren'Py instead. 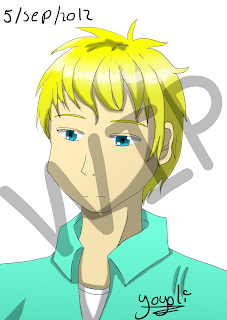 I was going to make my own visual novel engine but it's going to take more experience and practice as expected. That could take over a year to work out so that's why I've made the change. Thank you all for your patience! I'm working as much as I can to get this released as soon as possible with the best results~ It's a fun challenge haha! Sprites are all done! Backgrounds are pretty close to finish too. Image will change in the final version by the way. She's missing her sword!!! As I mentioned in the first post, the project is going to be a visual novel. The game simply requires you to enjoy the story and make choices. Depending on those choices you may achieve one of many endings. Doesn't seem like much but it is a fair bit! The game is going to be FREE and I'm still working out how to distribute it (the chances are... it will be in a Zip folder). The game is ONLY going to work on Windows (I'm not sure if it will the others but chances are no). It's a short game but I hope people will enjoy it nonetheless. That's all for now and expect more updates and even screenshots in the coming weeks.